I enjoy listening to the Health Report, a podcast that is broadcast weekly by the Australian Broadcasting Corporation. The host is Dr. Norman Swann and he delves into each topic with enough depth that it's educational and thought provoking. Each episode is about 30 minutes long. This week, I listened to the September 13th edition on homocysteine and brain atrophy. I'll be the first to admit that I didn't even know what a homocysteine was, and I'm still not going to try to define it for you. However, the podcast was fascinating and has interesting repercussions for treating Alzheimer's disease and mild cognitive impairment using vitamins. You can listen or read the full transcript on the Health Report site or download the podcast on iTunes. Do you have a favorite health or wellness related podcast? If so, please share it here. I'd like to find some other good podcasts that might help make my commute seem shorter. In The Blue Zones: Lessons for Living Longer From the People Who've Lived the Longest, National Geographic explorer Dan Buettner visits four places where people are living the longest, healthiest lives anywhere on the planet -- Sardinia, Italy; Okinawa, Japan; Loma Linda, California and Nicoya, Costa Rica. The book is an engaging easy read filled with so many good stories and ideas, I wanted to take notes, so I thought I'd share them with you here. 1) Move. People that live the longest are physically active much of most days. Most don't run or go to the gym, but they engage in low-intensity activities like walking and gardening as part of their daily work. The time outside also allows people to get a steady dose of vitamin D from the sunshine. It was interesting that they pointed out that Okinawans sit on the floor and probably strengthen their legs just by getting up and down throughout the day. 2) Hara Hachi Bu - eat until you are 80% full. This comes from the Okinawans, stopping when you are no longer hungry, but not quite full is a good way to avoid overeating. Eat your biggest meals at breakfast and lunch. Nicoyans, Okinawans and Sardinians all eat their big meal at midday. Loma Lindans eat their big meal for breakfast. Without exception, the people that live the longest maintain a healthy weight over the course of their lives. 3) Eat whole, unprocessed foods and a mostly vegetarian diet. The cornerstones of a longevity diet are beans, whole grains and vegetables. Pork was eaten in three of the four Blue Zones, but it was only consumed three or four times per month. Seventh-day Adventists consume nuts daily and they have been shown to reduce the risk of heart disease and have other health benefits. People in all four Blue Zones maintained gardens growing their own fruits and vegetables. 4) Say Cheers. In Sardinia they drink red wine. In Okinawa, it's sake. Consistency and moderation seem to be the key. The other beverages consumed by centenarians seemed to be limited to water, coffee and tea. 5) Live with a strong sense of purpose. The people that live the longest have a reason to wake up in the morning. They enjoy caring for their families, engage in work they find meaningful or volunteer. 6) Slow down and de-stress. People in each of the Blue Zones take time to appreciate family, friends and their surroundings. I was at a conference recently where one of the speakers suggested that we should all try to be calm, confident, patient and present. Centenarians seem to have mastered this. They also have close relationships with friends and neighbors and visit almost daily. Oh, and I almost forgot, get enough sleep -- 7 to 9 hours each night. 7) Practice your religion. All the centenarians interviewed seem to have faith. Studies show that attending religious ceremonies even just once a month increases you life expectancy. 8) Put your family first. The people that live the longest marry, have children, and build their lives around that family core. Their lifelong devotion pays dividends as they get older and their children reciprocate their love and care. In three of the four Blue Zones, the younger generation welcomes the older generation into their homes. 9) Surround yourself with those that share these values. Social connectedness is ingrained into the world's Blue Zones. In the book Connected by scientists Nicholas Christakis and James Fowler, they present compelling evidence for our profound influence on one another's tastes, health, wealth, happiness, beliefs, even weight, as they explain how social networks form and how they operate. 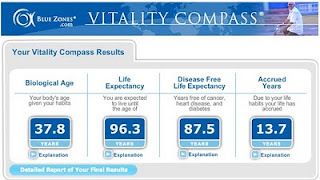 There is a corresponding website that allows you to calculate how long you're likely to live given you current habits using a tool called the Vitality Compass. It didn't take long to complete and it's kind of fun to see the results. Here's mine. The Danish Twin Studies established that less than 25% of how long the average person lives is dictated by genes. In other words, most of how long and how well we live is up to us. Choose wisely! Studies show the effects of a Vitamin D deficiency can be broad reaching including an elevated risk of colon cancer, breast cancer, prostate cancer, high blood pressure and cardiovascular disease, osteoarthritis, and immune-system abnormalities; not to mention the obvious impact on bone development and bone loss. According to an article in the LA Times, a study of 13,000 Americans, published in the Archives of Internal Medicine, found that 50% to 75% have suboptimal levels of Vitamin D by current standards. 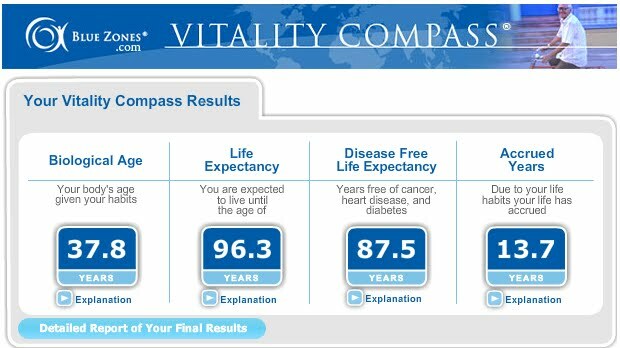 I started learning about Vitamin D deficiencies five years ago and have since been trying to offer Vitamin D screening as part of our wellness program. For some reason, no one wanted to do it. Finally, LifeWork Strategies agreed to conduct the screening for us. Last May, we offered Vitamin D screening to our staff during our annual wellness fair. 67 people were screened. 47 were in the desirable range and 20 were low. 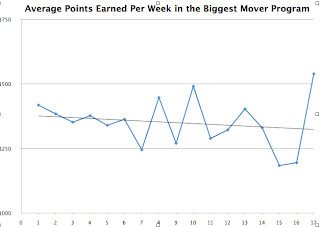 Lifeworks Strategies phoned the 20 people with a low result and suggested they follow-up with their physicians. I'm reviewing a report on our top 20 drugs by fills now and Vitamin D shows up as #3 with 44 prescriptions filled. This is the first time Vitamin D has ever showed up on the list. The cost for all 44 prescriptions is only $116.47. There are tons of articles out there on Vitamin D. Here are a few that I found particularly interesting. We held the closing celebration for our Biggest Mover program today. 58 of the 98 active participants earned a President's Challenge Award. We also had an additional ten people participate as friends and family and four of them earned awards. We ran the program from May 4 through August 31. People seemed to loose interest the last couple of weeks, so that might have been a tad long. 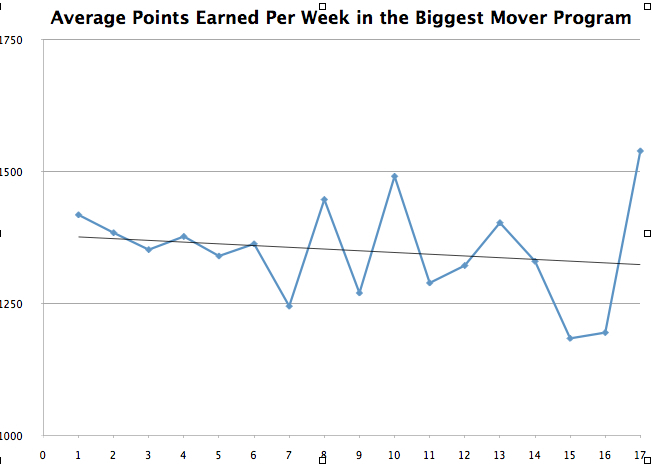 However, the President's Challenge just changed the points needed to earn awards essentially doubling them. If you shortened the program now, people wouldn't have time to earn a variety of awards. We provided President's Challenge certificates to everyone who earned them. We also recognized the winning team, the top three point earners, and the individuals that improved the most in a fitness test that TrueFT ran for us at the beginning and end of the program. Overall the program was a lot of fun, inexpensive, and fairly easy to administer. Try it in your workplace. The work of our Green Team often supports our wellness efforts. We all work in a wonderful Gold LEED Certified green building. Our indoor air quality is exceptional and free of pollutants and all our workspaces are ergonomically designed for the staff's comfort. The use of natural daylight is maximized and most staff enjoy unobstructed views of the outside. All things that are good for our bodies and souls. Today our interests overlapped in a slightly different way. The Green Team helped us to plan a Lunch & Learn session on the benefits of eating seasonal and local. Cindy Mann presented the session. Cindy has talked with us before and the staff lover her. She's warm, entertaining and knowledgeable. Cindy is the founder and director of Boundless Wellness, but we know her through our partnership with LifeWork Strategies. Give Cindy 15 minutes and you'll be itching to go out and eat some kale. (See one of her kale recipes on slide #15.) Cindy mentioned that she really enjoyed Animal, Vegetable, Miracle by Barbara Kingsolver. I already have it downloaded to my Kindle. View more presentations from Janet McNichol.